This homely apartment, located in the wonderfully historic area of Sant Pere is a fantastic place to be based in Barcelona. Surrounded by shops, bars, cafés and restaurants you´re guaranteed a great stay here. 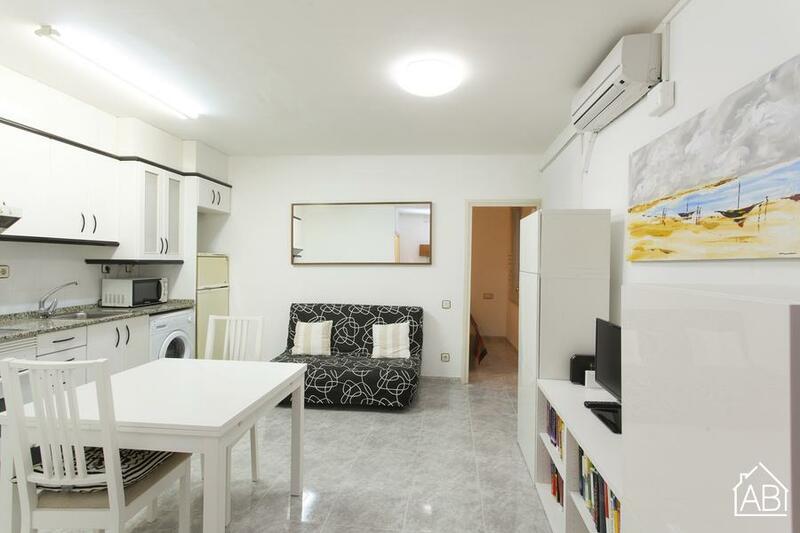 Located within walking distance to the famous Ramblas, Plaça Catalunya, and Parc Ciutadella and with public transport nearby this is city living at its best. The apartment has a cosy, quirky finish and with two bedrooms it can easily accommodate four people. There is a fully equipped open plan kitchen-living space and a clean, modern bathroom. Everything you may need for a comfortable stay is provided in the apartment: Internet, TV, air conditioning, heaters, and more. "Constructed in the 13th century, Sant Pere is one of the oldest neighbourhoods in Barcelona. Located in the ´Old Town´ district of the city, the area takes its name from the Monastery of Sant Pere de les Puelles, built in the 10th century. Here, you can still see the old, Romanesque church that was part of the monastery. The area of Sant Pere maintains much of its medieval architecture and has many narrow, winding streets, prefect for discovering some of Barcelona´s more authentic stores and eateries. That being said, some of the buildings in the town were actually reconstructed in the 17th and 18th centuries when the neighbourhood was the centre for textile production in Barcelona. In Sant Pere you will find some of the city´s greatest jewels of Catalan ´Modernisme´ such as the Palau de la Música Catalana, designed by the architect, Lluís Domènech i Montaner. Situated near Barceloneta and El Raval, and with easy access to the trendy El Born neighbourhood, choosing an apartment in Sant Pere is ideal for those looking to enjoy an authentic Barcelona experience. "